In a large bowl, combine butter, cream cheese, egg yolks and flour; beat until smooth. Shape into 1-in. balls; place in a container with waxed paper separating each layer. Cover and refrigerate overnight. 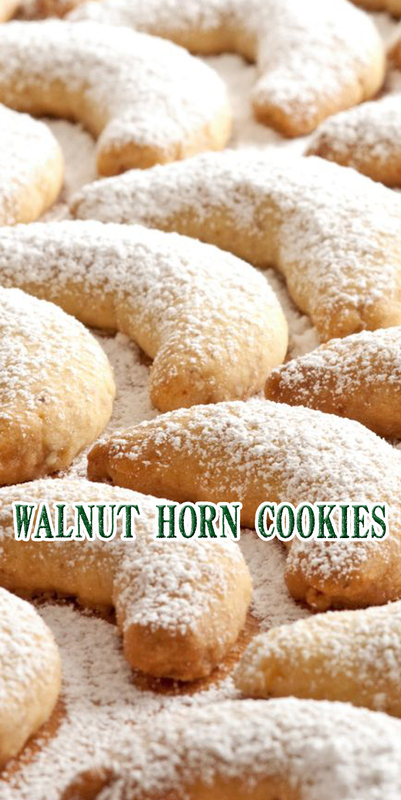 For filling, combine walnuts and 3-3/4 cups sugar (the mixture will be dry). In a small bowl, beat egg whites until soft peaks form; fold into nut mixture. Add extracts and a few drops of water if necessary until filling reaches a spreading consistency. Place remaining sugar in a bowl; roll cream cheese balls in sugar until completely covered. Place a few balls at a time between two sheets of waxed paper. Roll balls into 2-1/2-in. circles. Gently spread about 2 teaspoons of filling over each. Roll up; place seam side down on ungreased baking sheets. Curve the ends slightly. Bake at 350° for 20 minutes or until lightly browned. Cool on wire racks. Let the cookies cool completely and then give them a second dusting.